Temporarily at least, Eastern Bluebirds are billed as a success story due to human intervention. Once, in Audubon’s day, they were considerably more numerous, especially in the northern states. The species’ population decline has been attributed to many factors, including the introduction to the U.S. from Europe of the House Sparrow in 1851 and of the Starling in 1890. Each of these birds competes with the much less aggressive bluebird for nesting sites. Chemical spraying of trees has also taken its toll, as has severe weather. But the introduction of bluebird boxes in hospitable locations—a custom practiced even in Audubon’s day (also by Lucy and JJA) before environmental hazards were as extreme—is slowly helping to stabilize the Eastern Bluebird. Although populations declined further in the 1960s and 19760s, they rose thereafter due to the increased popularity of nest box campaigns. 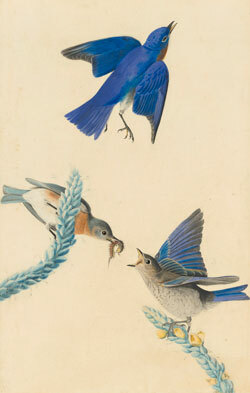 Still vulnerable to competition from introduced competitors, it is encouraging that Eastern Bluebirds typically have more than one successful brood each year. The male does a “Nest Demonstrations Display” at the nest cavity to attract the female. He brings nest material to the hole, goes in and out, and waves his wings while perched above it. That dance in several acts is pretty much his contribution to nest building; only the female builds the nest and incubates the eggs.